where his guest would sleep following his arrival that autumn. “Van Gogh saw the production of the Sunflowers for Gauguin’s bedroom as a way of enticing his friend to come from Brittany,” says Bailey. 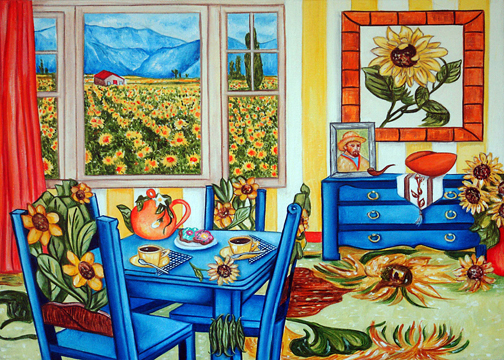 here having tea with Vincent overlooking a sea of Sunflowers. one of his paintings. I love the soft greens against the golds. represents the brilliant blue he always used in his paintings. Just got this lovely email from one of my collectors and wanted to share: Thank you Heather. This is a divine painting - absolutely beautiful. Love Van Gogh - Love the 'blue' colour of the furniture, in the style of Van Gogh's furniture (rustic) in his bedroom painting. Almost bought a pale 'blue' suede 3 seater sofa when we were living in Sao Paulo for 5 years in the 1990s. Regret not having bought it. T his painting will bring so much joy to anyone who sets eyes on it. It would have made Van Gogh proud - you have captured his essence in it. Anyone who paints flowers such as Sunflowers, Narcissus/Daffodils ,Irises, Peonies must have a beautiful soul. These flowers are so beautiful (not forgetting orchids and Pansies). If I had to live in a house like this overlooking a beautiful field of Sunflowers I would spend my whole life day dreaming. Love the orange centres you've given the Sunflowers - brings them to life in a special way. 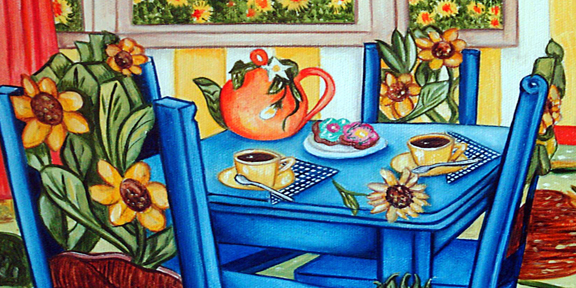 The colour co-ordination of the added items in the picture such as the dark brown of the backs of the chairs, the orange frame of the picture on the wall, the beautiful carpet , the teapot, the bowl on the side board, framed photo of Van Gogh with his pipe, the curtain, the little red roof house in the background with the backdrop of the blue mountains add so much charm to this particular painting of yours - making it really 'Special' in every way. 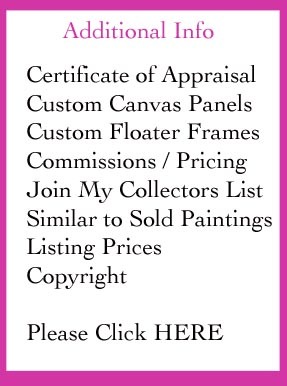 This means you must have been in a beautiful frame of mind while painting. Thank you so much for sharing this painting with me. Hope both you and your hubby are doing fine. Thinking of you. God bless!